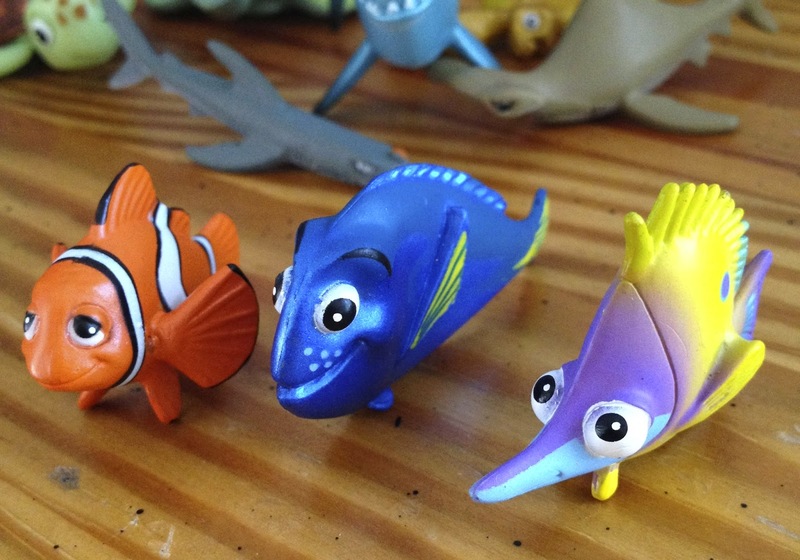 Back in 2003, Hasbro Toys released a bunch of Finding Nemo merchandise to coincide with the film's release. Their line-up included a selection of bath toys, plush, games, candy and, of course (no toy line would be complete without them), figures and play sets. 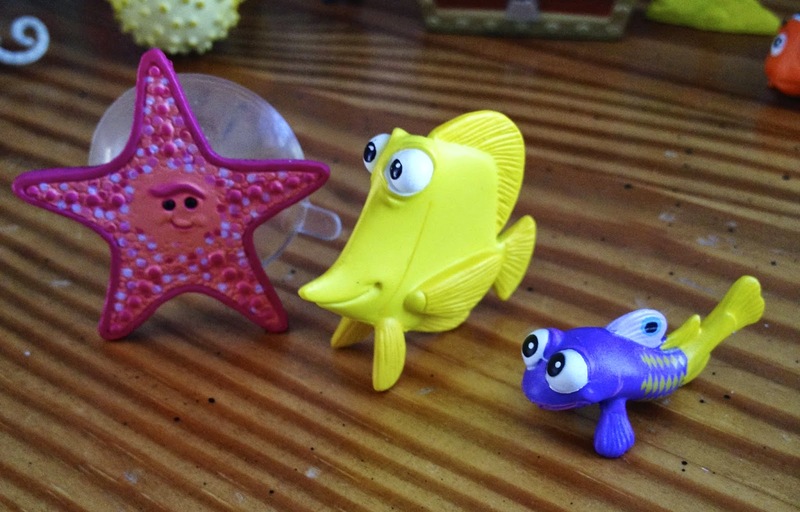 In today's post, I'm thrilled to share with you the "Aquarium Adventure" playset as well as two figure gift packs, "Aquarium Gang" and "Ocean Gang", which are all apart of Hasbro's Finding Nemo Figure/Play Set collection and are meant to be used together. 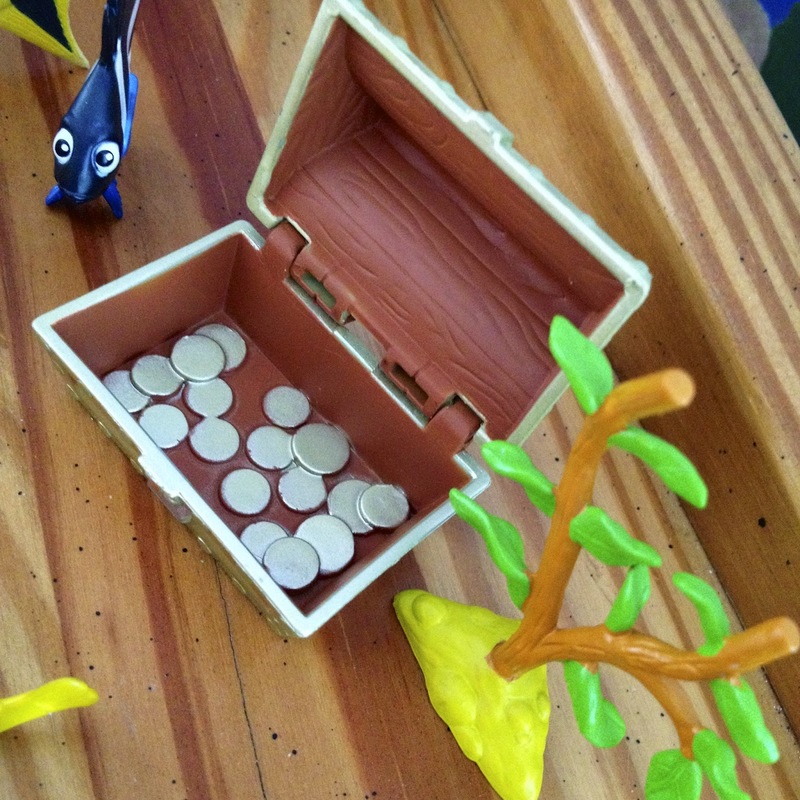 There is one more play set as well, "Fishing Boat Escape", that I have yet to track down. These items are extremely rare. It's hard enough to find pictures of them online, let alone find them for sale on eBay, so how did I get them? 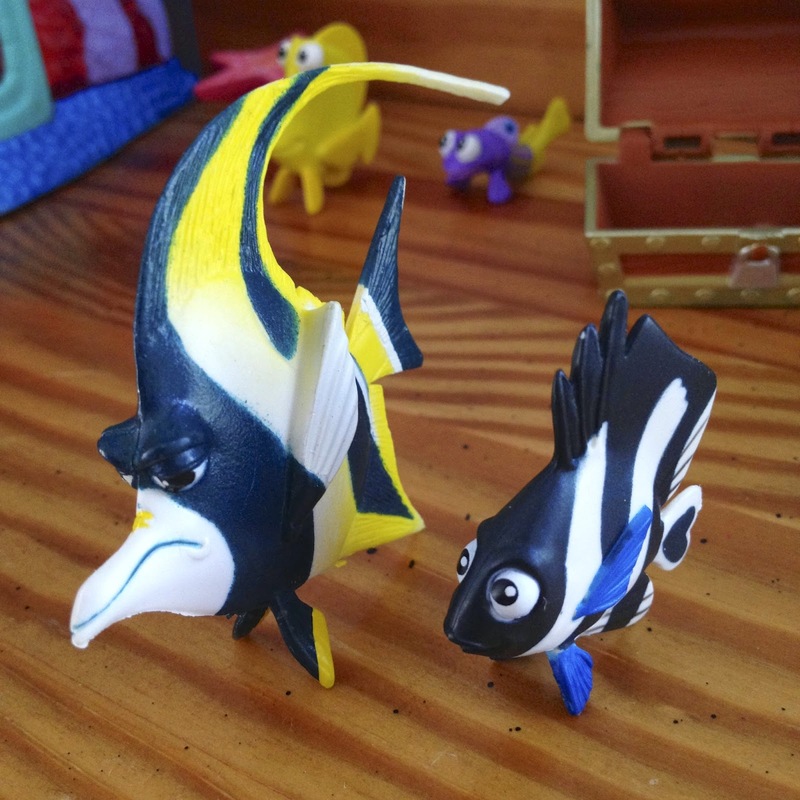 Well, here's my success story: a few weeks ago, I was online just casually browsing for old Finding Nemo merch that I may have let slip under my radar. During my search, I came across THIS small/blurry image from an old eBay listing. It really sparked my interest and I immediately started searching around for them. 30 mins of searching later, I had no luck whatsoever. I then found this 2003 Toy Fair press release (scroll down to the very middle of the page), which made me even more interested in tracking the figures and the play sets down. 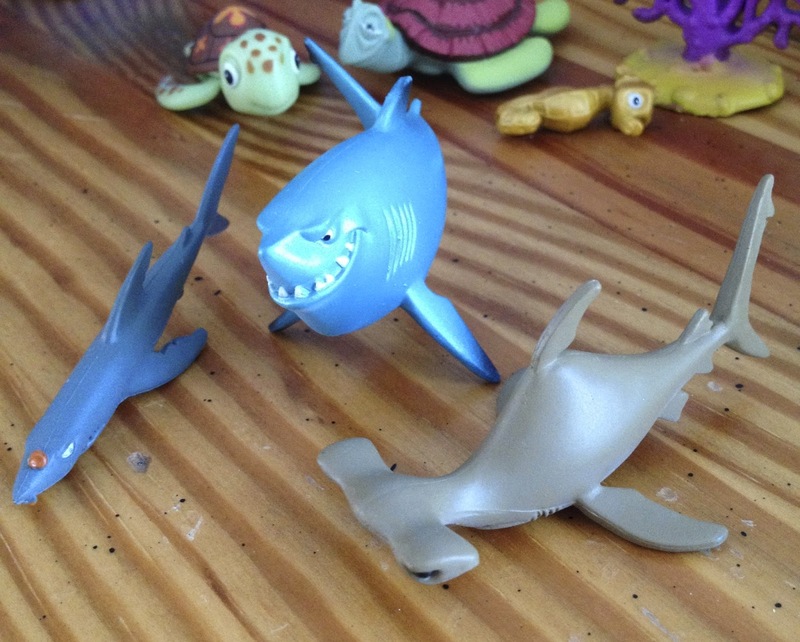 It was after midnight and I was concluding my search by just typing in "Finding Nemo figures" on eBay (rather than the name specific searches I was doing up to that point). I scrolled down the page, and in a small eBay search results thumbnail, I saw them. I recognized the figures and play set immediately. The catch? The listing was ending in 36 seconds and no one had placed a bid. I had that amount of time to click on the listing, enlarge the picture and make sure every single character and accessory was there. Sure enough, all was accounted for, and with three seconds left, I put in my bid and won the auction for only $9.99! It was unreal. Yes, I was getting everything loose without the original packaging, but it didn't even matter to me since I probably would have opened it up one of these days anyway. This set includes everything you see in the image above and is based on [some of] what you see in the "Tank Gang's" dentist office aquarium. 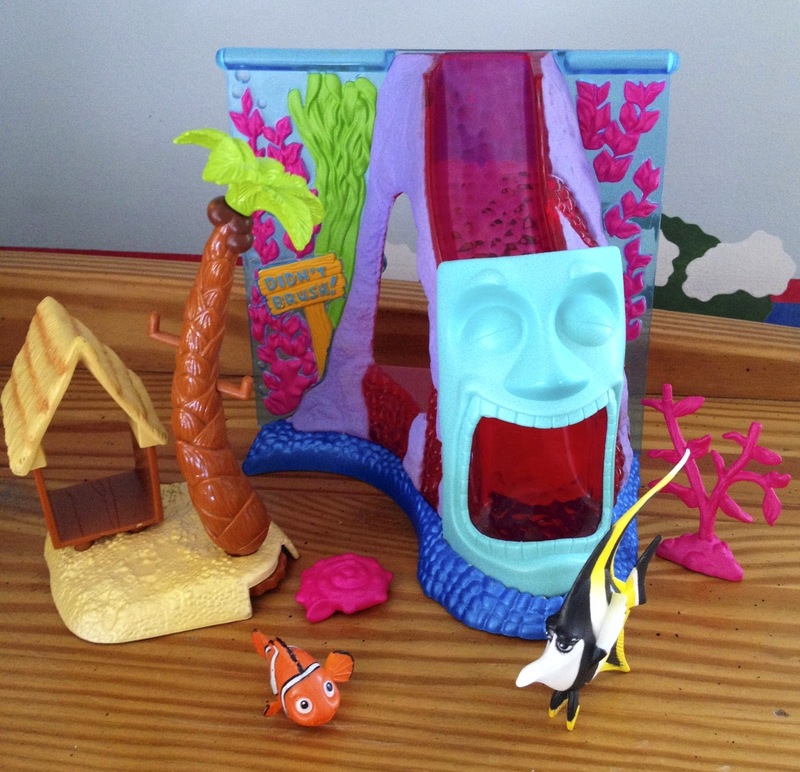 We have a Tiki mask/Mount Wannahockaloogie slide (the main portion of the set) as well as a Tiki hut/palm tree base, a hot pink shell and kelp tree and two figures: Gill and Nemo. See the official press release packaged photo of this set HERE and the official loose photo HERE. 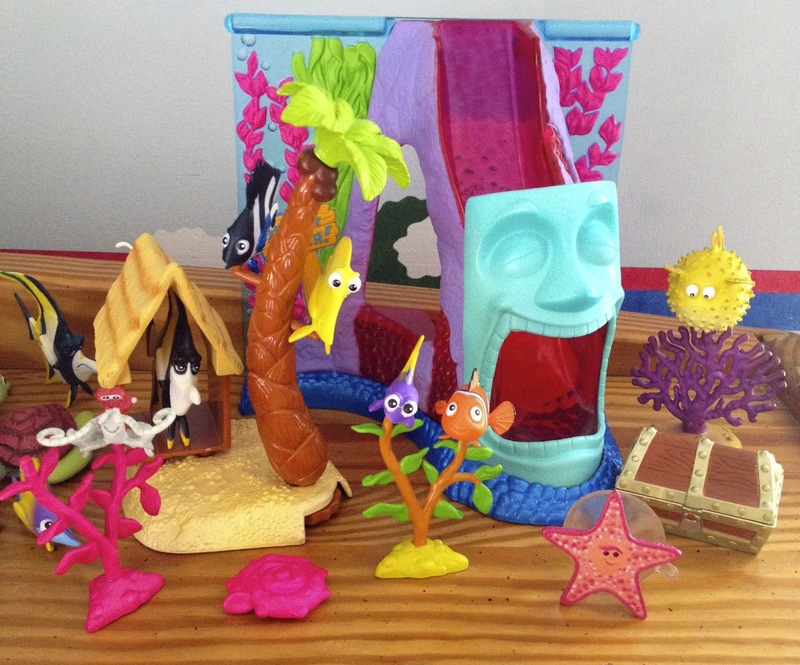 One of the set's play features is that Gill can be inserted onto one of the pegs sticking out from the palm tree or on top of the pink kelp tree. Turn the dial on the bottom of the palm tree's base to spin the tree and simulate "swimming action" (video example below). 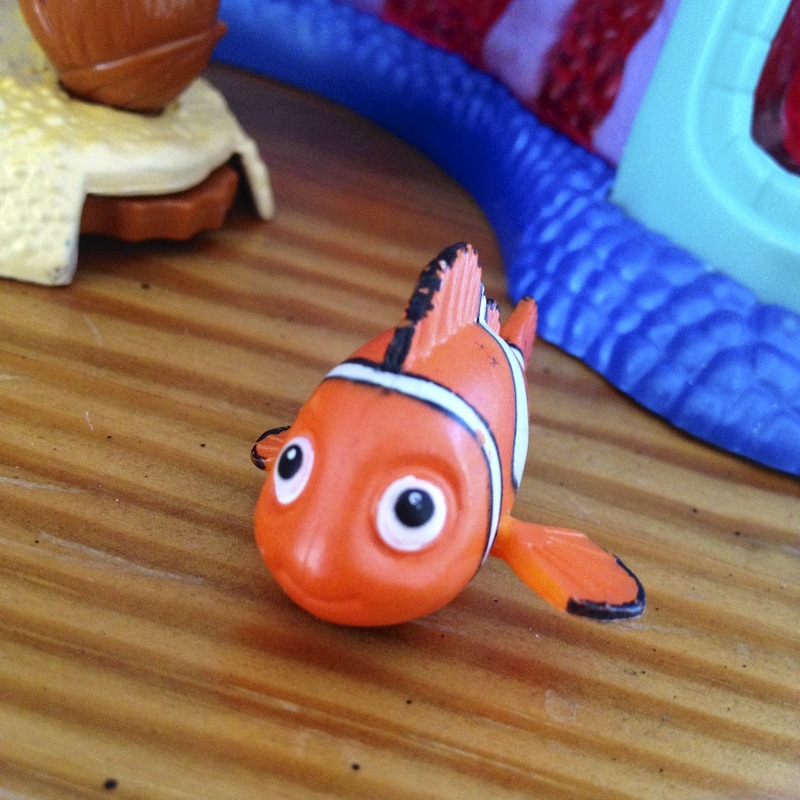 As seen below, Nemo also has a play feature. 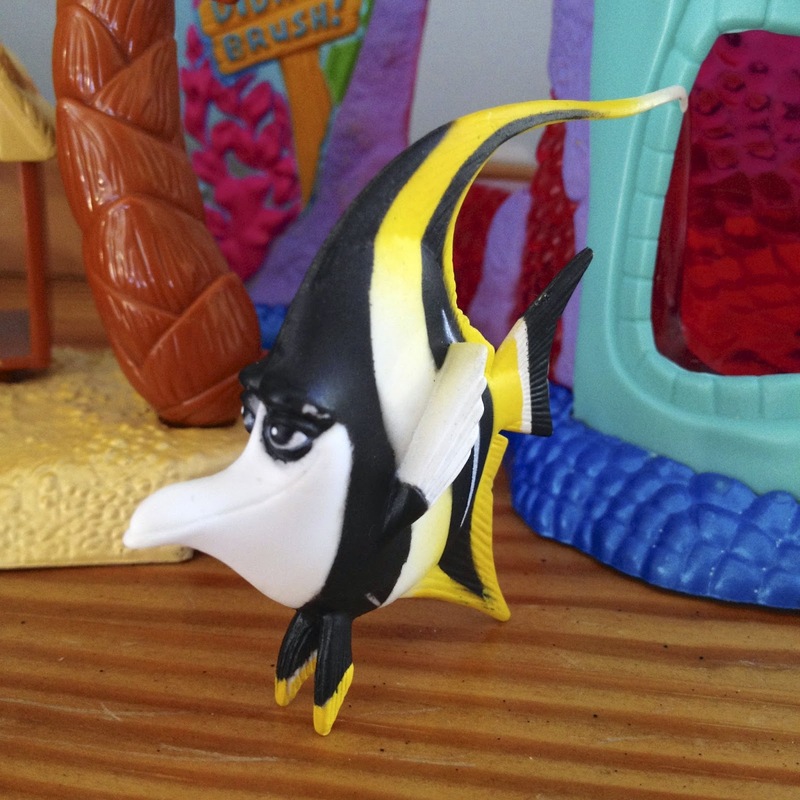 He has a wheel on his belly which gives him "swimming action" (his fins spin) when you push him along (video example below). 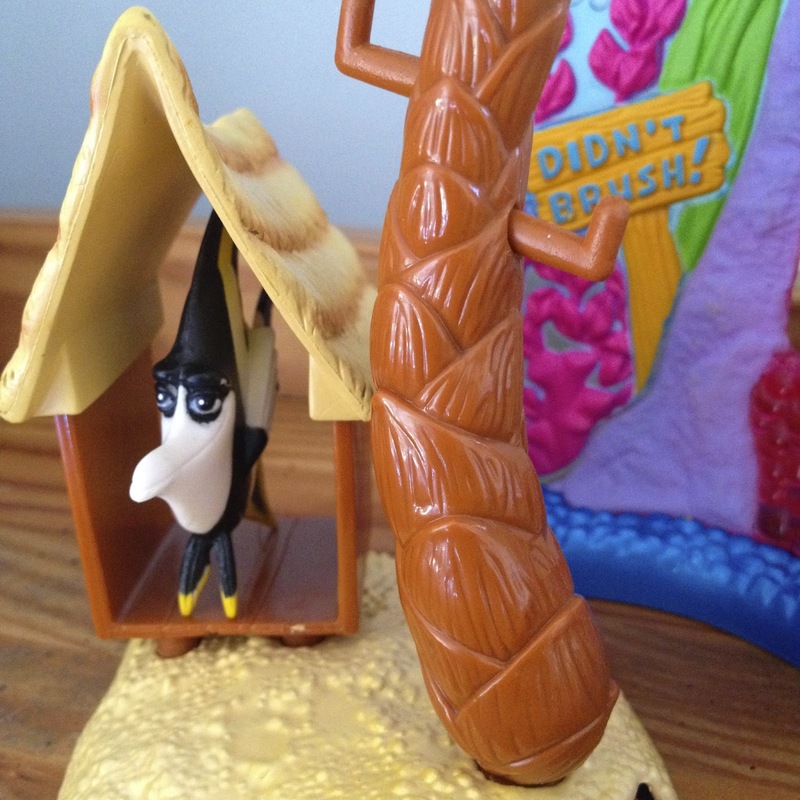 Finally, turn "Mount Wannahockaloogie" around to reveal a "hiding place", including a shell that can be opened and closed. 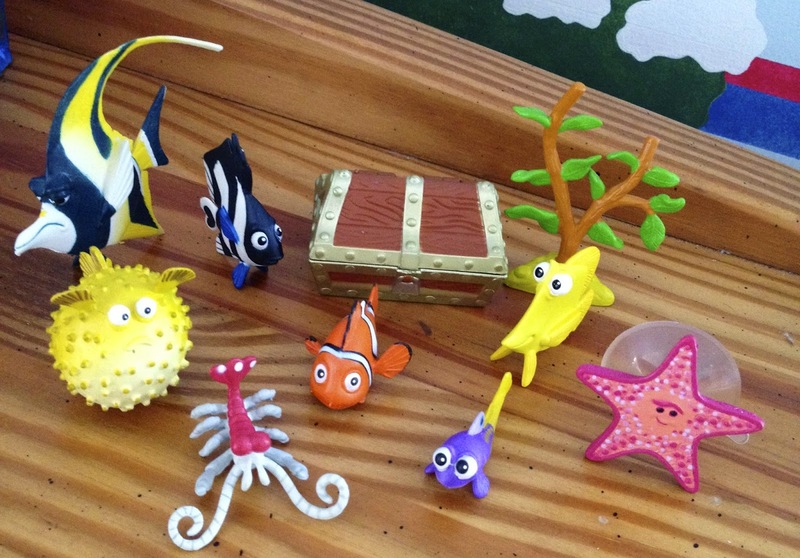 This set includes the entire "Tank Gang" seen in the film: Gill (same one from the Aquarium Adventure Play Set), Deb, Bloat, Nemo, Jacques, Bubbles, Gurgle and Peach. 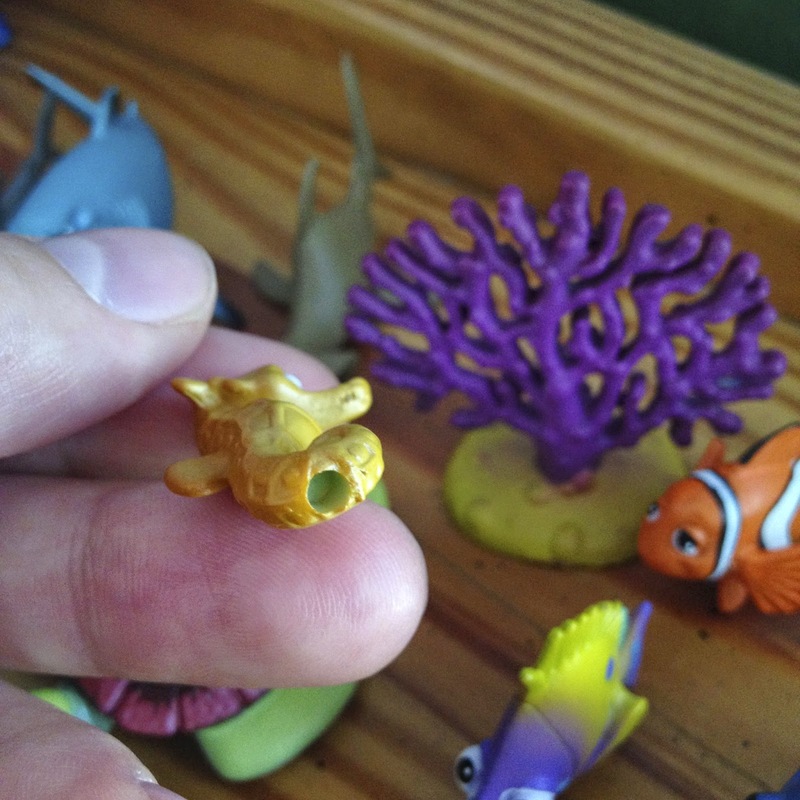 This set also includes additional accessories, such as an opening treasure chest (the one that Bubbles obsesses over in the movie) and a kelp tree. There are ten pieces to this set total. 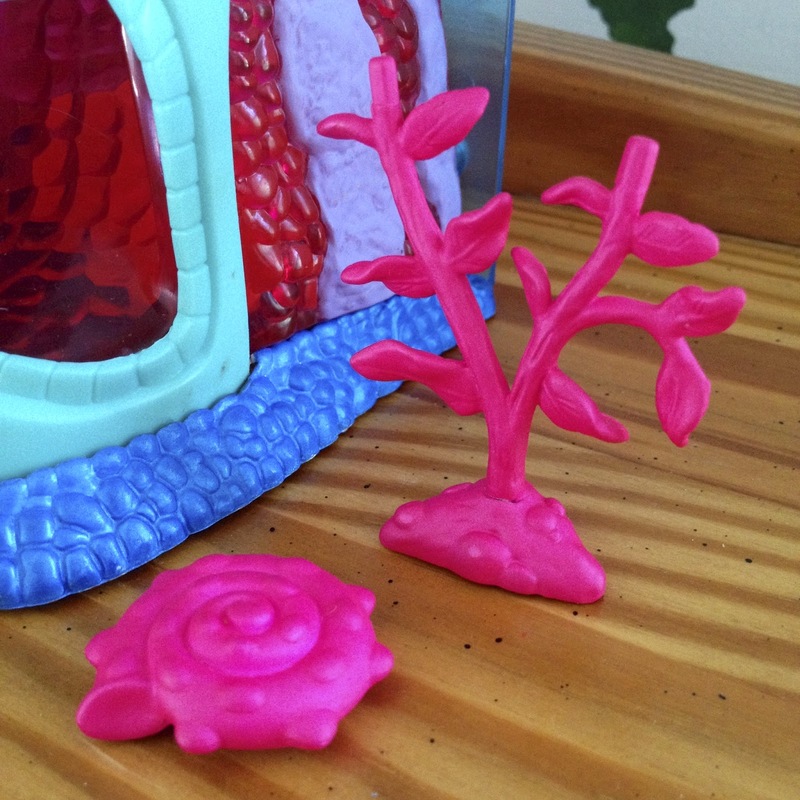 Aside from Peach, each character (like Gill from the Aquarium Adventure Play Set), has a hole underneath them so that they can be attached to the play set's palm tree or on top of either of the kelp tree accessories. 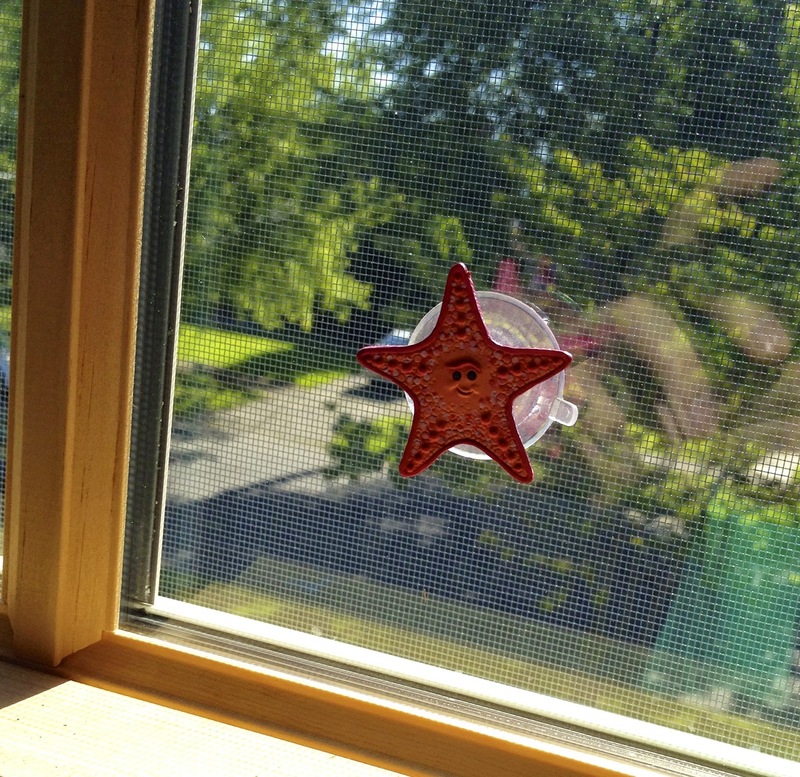 What's cool about peach is that she's fastened to a suction cup that can be attached to any glass, plastic or other similar surfaces. 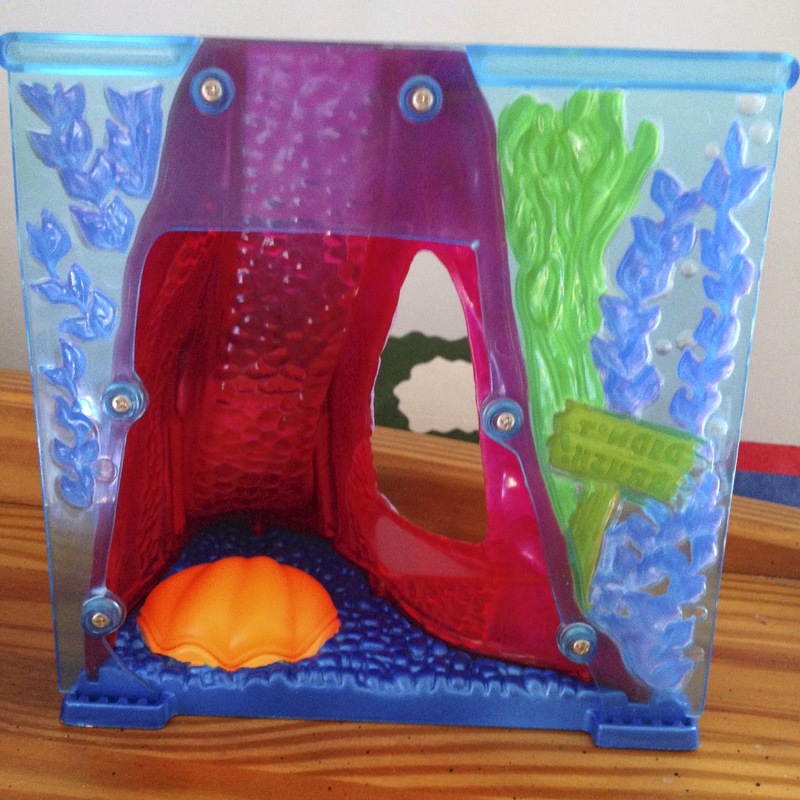 Note: The Nemo included with this set is not the same one included with the Aquarium Adventure Play Set. 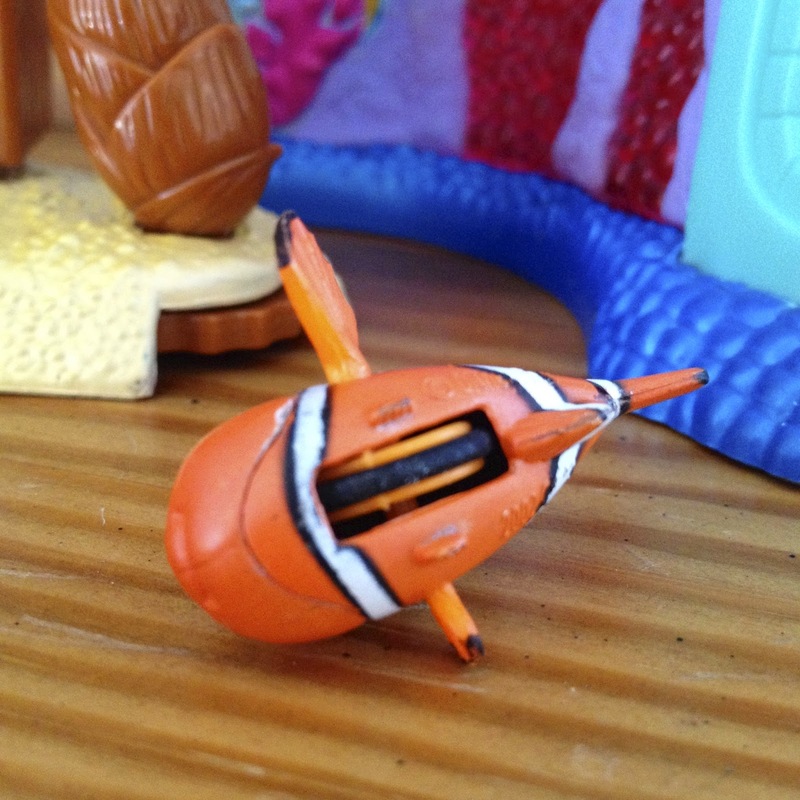 This Nemo, like the rest of the gang, has a hole underneath him (rather than a wheel). 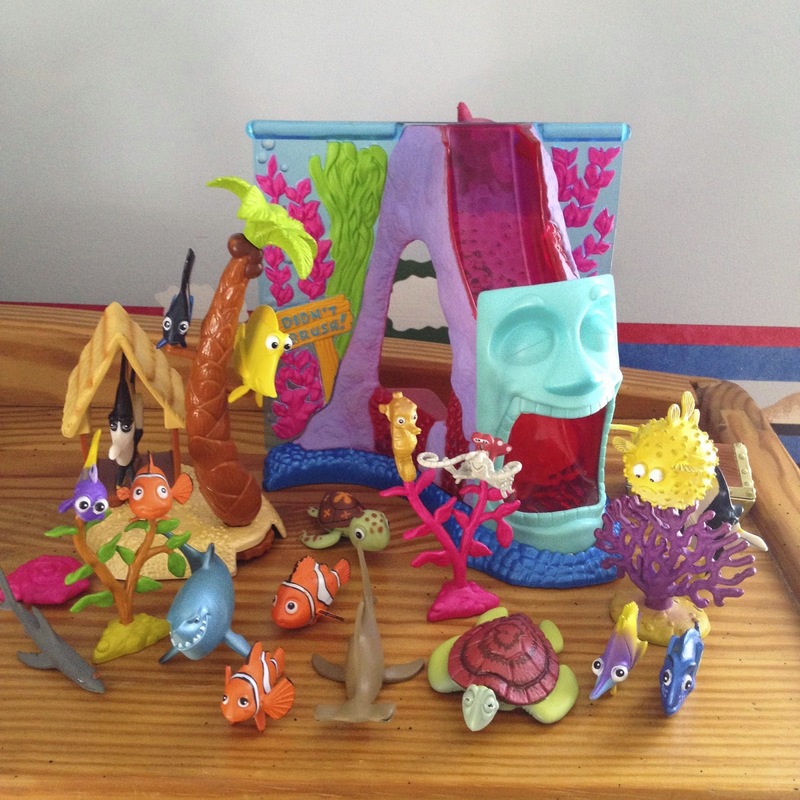 This is another ten piece set that includes: Chum, Bruce, Anchor, Sheldon, Squirt, Crush, Tad, Marlin, Dory and a purple coral tree. Again, Sheldon, like the rest of the fish characters, can be attached to the coral tree or other trees included throughout the sets. 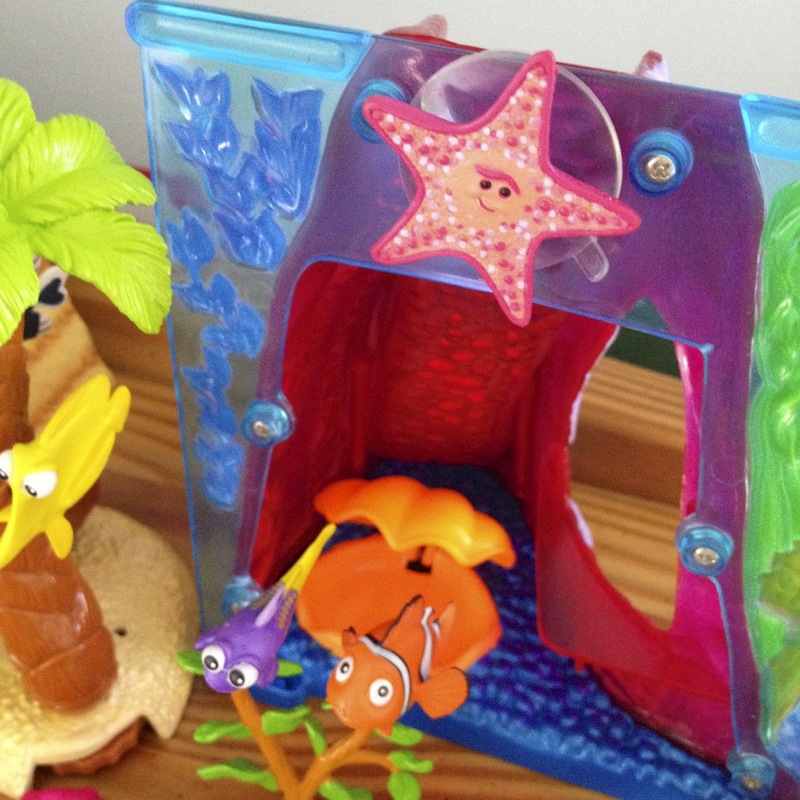 Similar to the Nemo included with the Aquarium Adventure Play Set, the Squirt figure here moves his fins and "swims" as you push him along (video example below. 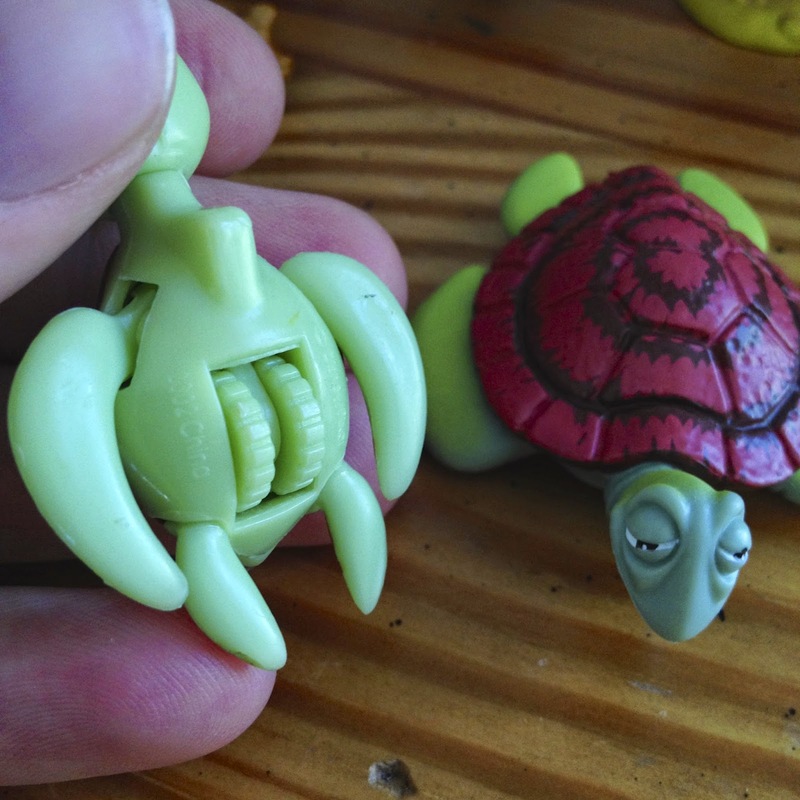 Note: Squirt's wheel has less grip than Nemo's and wouldn't work on hard wood. I had to find a different surface where he would work, hence the board game box). Again, see packaged photos of both figure sets HERE. Sorry for the quality, it's literally the only picture I can find online of both sets. If you're thinking what I'm thinking, you're wondering "Hey! Where's Pearl?" 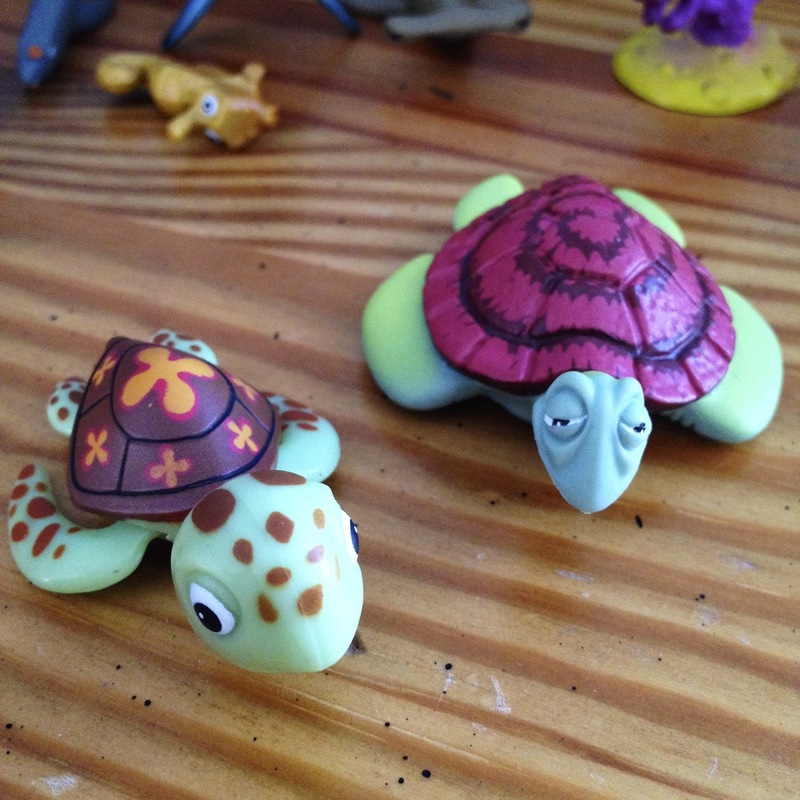 It seems only natural that they would have included her in these sets along with Sheldon, Tad, Nemo and Squirt. 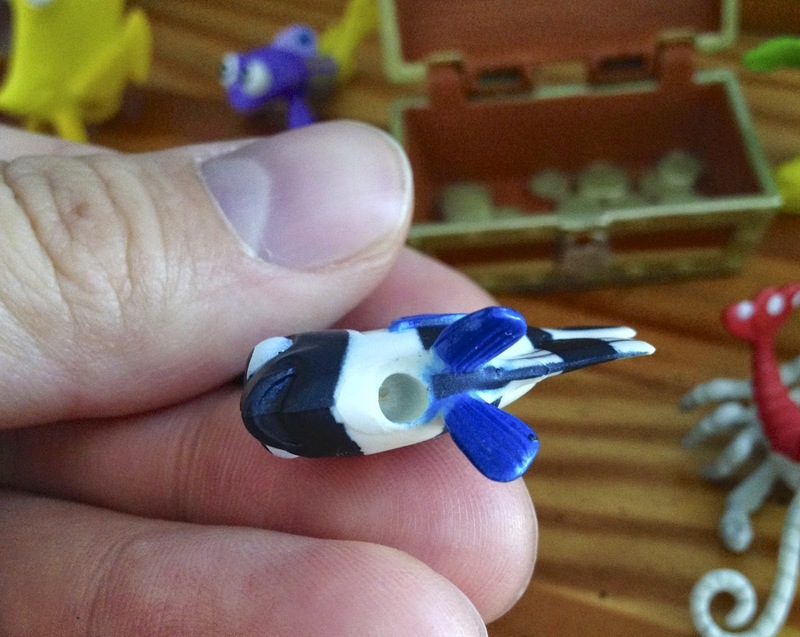 The answer to that question is that she was made and is included in the other play set that goes along with this line, "Fishing Boat Escape." 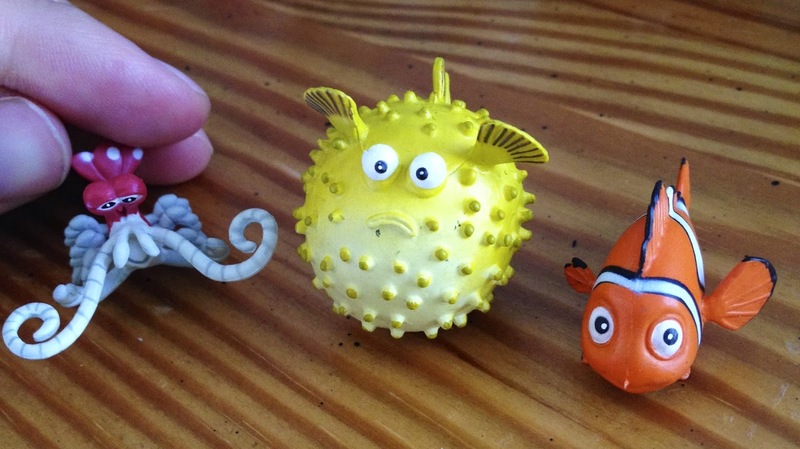 As mentioned at the beginning of this post, I've yet to track down that one, but hope to complete this Finding Nemo Hasbro figure collection with it soon enough. 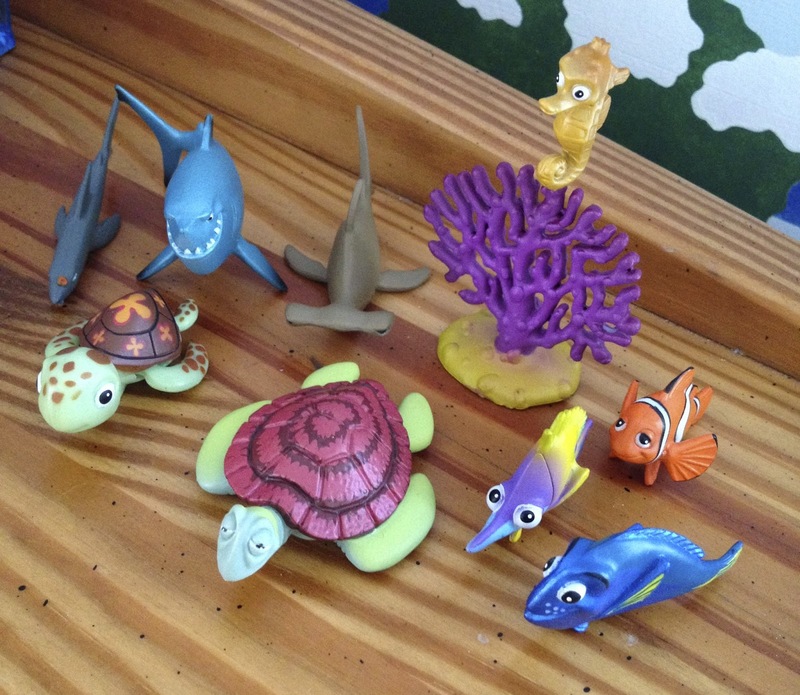 If you're now interested in tracking any of these Finding Nemo figure/play sets down, keep checking eBay regularly and hopefully you'll hit the jackpot. Best of luck! Please, feel free to comment with any thoughts or questions you might have. 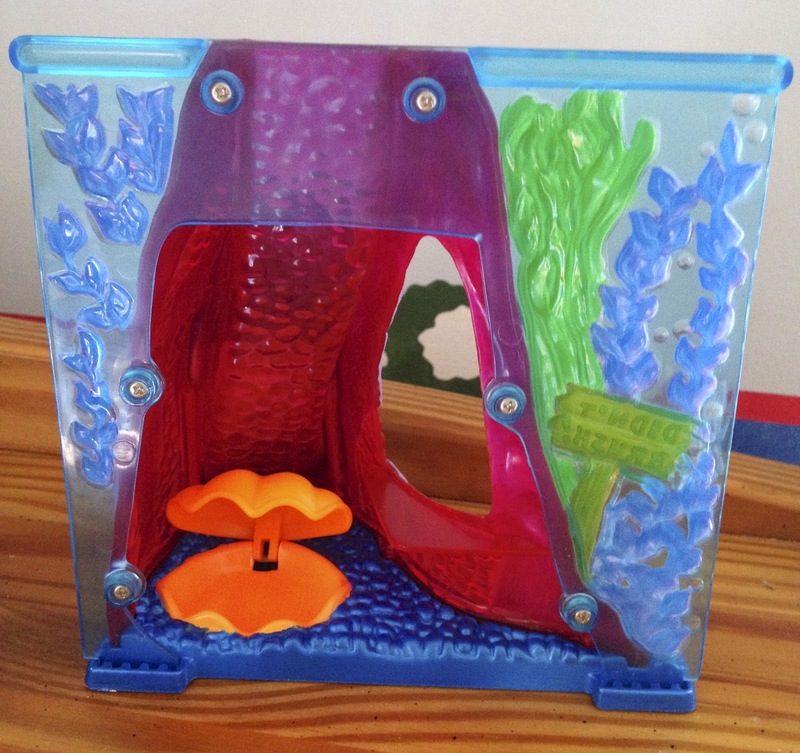 UPDATE 4/13/16- I finally got the "Fishing Boat Escape" Play Set I mentioned here! This collection is now complete. Visit my full post HERE to check it out.